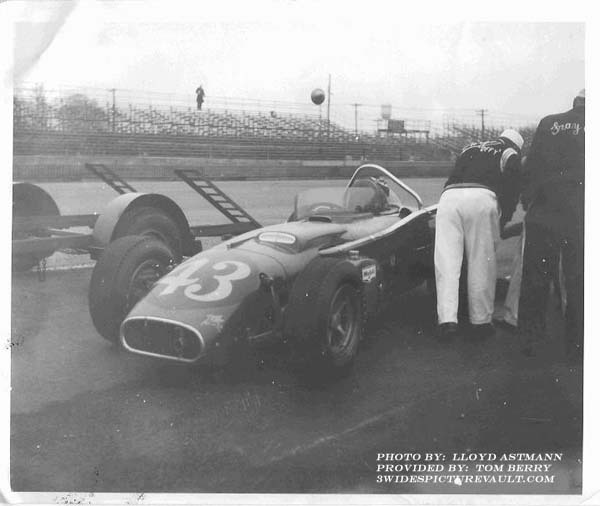 Comments: Another open wheel photo from Trenton 1964, the Jake Vargo Offy. 02/05/05 3-Wide Unfortunatley, Bruce Jacobi was severly injured at Daytona in a stock car during one of the 125's in the early to mid 70's and I believe he passed away years later from those injuries. 11/26/08 Ed Duncan April 8,1962 Trenton 100. The Ray Brady Roadster driven by Jiggs Peters. The car did not qualify for the race.